Hello again dear friends! I honestly cannot believe it is already September! Where has the year gone? 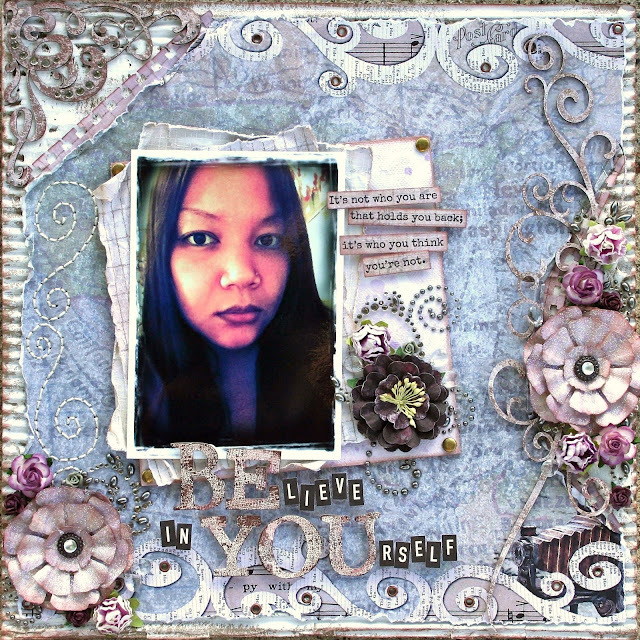 I used Donna Salazar's Antiquities Collection for this layout. I think it is my all-time favorite. I adore the colors and feel of each of her beautiful designs. I also love that each paper can be used for either a girly or a masculine layout. The title is made up of Grungeboard letters and alphabet stickers that were adhered using adhesive foam for added dimension. The Grungeboard letters were inked with Donna's new Mix'd Media Inx and then embossed with white embossing powder by Clearsnap. Have you tried Donna's new Inx? They are AMAZING! Not only are they super juicy, but the colors are incredibly rich! I created this flower with Donna's Carnation Creations Die, and I coated it with my favorite glitter... Fairy Dust Glitter. You can find the tutorial for this flower HERE. These flourishes are hand-stitched. I actually used the flourishes on Donna's Tales of Travel paper (seen at the top and bottom of the layout) as a stitching guide. The layers of paper behind the photo were spritzed with Cashmere Smooch Spritz, one of Clearsnap's new colors. Behind my photo, I attached a Canvas Art Board Cover by Zutter. It is attached using Rivets which are perfect for fastening thick boards or corrugated board. The canvas was masked using a Prima mask and Smooch Spritz in Mixed Berries. The chipboard flourishes surrounding the flowers are made by The Dusty Attic. I used Corrugated Board by Zutter for my background. It was painted with white acrylic paint and inked with Chestnut Pigment Ink by Clearsnap. The decorative corner is also a chipboard element manufactured by The Dusty Attic. Thank you for stopping by and I wish you all a beautiful day! Oh, Natasha...there are always a few ugly people out there... it is a shame that they don't follow their Mother's advice...If YOU have nothing nice to say then don't say anything at all. WE would surely miss you, don't every stop ...I love your work, it always leaves e speechless and you inspire me so. Love this layout ~I might have to do this one myself to remind me, too. My strongest belief in life is to never let bad outway good. So if there is negative energy out there we can put out double the positive. It sounds like you have discovered a strength within yourself recently, perhaps brought out by all the bad things around you. You have inspired me so much I could never tell you. I truly believe we are not given more than we can carry, even though some times, our knees feel like they will bend and break. I know for sure there is someone out there willing to carry some of the weight we just have to let them. Keep staying positive and get through moment by moment. I totally understand the stress and negativity getting you down. Please don't let a few negative people ruin what you get from doing from your craft. It is rare to find ladies that are so talented and willing to share so much of their skills. I feel bad that you have received these negative remarks. I would keep comment moderation on-and when you see anything that sounds negative-just delete. I feel not even reading it or letting it in doesn't put it out or in to your life. Sending you a big hug and thank you for all the times you have inspired me. Wow Natasha,I could quite easily hey I've done that technique you've done, but I would never say it with the intention of making someone feel like they were less of a person/artist/scrapper than me just because I saw mine first! That is just crazy! I love seeing someone elses take on a technique. Like your eyelets and lacing.. I could do that every day on my projects but I can't wait to see what you do on yours! There will always be that unique Natasha flare that will keep me coming back and saying "Wow, I love how you did that!" ..........Don't you dare let anyone make you feel like it's time to give up!!! You can rock it with the best of them!..........This is a beautiful layout! I LOVE the sentiment, it is soooo true! I love what you did with the eyelets on this one! I love the stitched swirls too, I need to do things like that more often, I love that look! Fantastyczny, dopracowany, bardzo pracochłonny scrap! What a beautiful Layout - so many awesome details! Great work. Really sad that there are people out there who feel a need to do mean, spiteful things. I'm glad though that you've risen above their comments and are embracing your craft and your passion. You do such wonderful work and the world would be a sadder place without your layouts in it. What a stunning layout. I can tell you I am so very glad you keep creating and posting your wonderful creations. I for one have certainly gained many many hints, tips and tutorials from you. I even brought a crop-a-dile to try eyelets as you always make them look so fantastic. In life there are always negative and hurtful people and it is only the way we over come them that makes us strong. It is usually them that end up suffering. Forget about the ones who dont." I hope you are feeling well again soon and always wait for your next layout. You are so talanted and we would miss you very much if you didn't inspire us each and every day. My dear sweet Natasha...you are the one who inspires many...including myself! You have talent beyond your years doing this craft...it is a blessing for all who know you and follow you here. I too struggle daily with a medical condition..you inspire me to get through it. I believe in you ....appreciate your dedication to teaching us and creating beautiful pages of art...I am so grateful for you! All I can say is that reading your post brought many 'flashbacks' to my mind...we met approximately one year ago didn't we? :-) We've seem to pick each other up throughout this year haven't we? Sometimes you're down & I pick you up & heaven knows I get down too & you pick me up...I say we got a good system going...let's keep it up for many more years to come...what do you think? What a shame you have experienced such negativity :(. I for one love seeing your gorgeously detailed work. It always leaves me inspired. This page is stunning! Dear Natasha, just do what you do so well, create, share with freind and be happy! Your work is lovely, hugs! That's a lovely photo to start. Glad you show the detail shots, particularly the outer framing and corner are fantastic! It's sad to think that some people have nothing nice to say to other fellow scrapbookers. Scrapbooking is a form of art that we express & so what if we tried a certain technique, that is what it is for, to try it out. Everyone in one way or another try the same things but we always put our special touch to our layouts. I want to thank you for sharing your wonderful pages, it gives me great pleasure looking at your work. You have inspired me to try new things. Don't allow anyone take away what you love to do! Wow! What a wonderful page with so much details! I really love what you did with the title. Oh hon, I just want to give you a big hug! It's terrible that you've been made to feel bad like that! Believe me, we've all run into some comments like that in the past and although it hurts and can really frustrate, just remember there are lots of people out there that appreciate what you share with them whether it's a 'new' idea or not Just remember that most of the people out there are really kind and are so happy when we share out tips and ideas, and sometimes the people making those comments probably don't even realize how they are coming across. Don't stop what you are doing, your work is gorgeous, and have to say it's hard to believe you've only been doing this for a year...your work is so seasoned and beautiful! Hang in there sweetie! Your L.O. is stunning, love it. I felt so upset for you reading your post. It is very very sad, that there are people out there that feel they have the right to put other's down. I'm so pleased that you didn't let them put you off. Your creation's are always delightful/beautiful to look at, and IF there is a technique that you can show (as well), then that's a double bonus. I have found in the crafting world, that the (majority) are kind decent nice people, who delight in helping other's. But unfortunately you can come across (a few) that have a hidden agenda' they are only happy if they are either blowing their own trumpet or (worse still) putting other's down, thank goodness they seem to be in the minority. My dear Mum (when she was alive) was a very kind wise soul, and she used to say if you can't say something nice about someone/something then don't say anything. If you have any more of these horrible comments, I would just delete them, ignore them & these bullies will get fed up & will stop. hi.. oh i am so sorry to hear about the negativity you have experienced.. i really love your scrapping and have learnt so much from all that you share.. i am glad to hear you have been able to let the negativity go... it is not worth reading that stuff.... and i can relate about scrapping being a kind of therapy, it is to me too.. my little zone where i go to escape.. this layout is stunning.. i love everything about it.. you rock and you are so talented.. keep scrapping and exploring you.. the quote is so true.. but please be encouraged by the people who really love your scrapping and then just create for you.. you have a true gift.. and i am a huge fan and supporter!! thanks for always sharing the most amazing layouts and techniques.. have a wonderful day! I just found your website last week and in that week's time you have inspired me to make 5 layouts. About the response of "I've already done that technique before": I've been scrapping since 2002 and some of your techniques have been done before but you have made them fresh and new. So I pulled out my old stash of corrugated paper and used it in a fresh and new way after being inspired by you. I used eyelets that I've haven't touched in years and laced up layouts in a new way. So thank you and please focus more on your positive comments and feedbacks and igore the negative ones because you are a talented artist that inspires. Thank you for posting this Natasha. I will never ever understand the nasty/competitive side of scrapping- it's totally alien to me- I totally pulled out of Scrapbook.com and other message boards because I noticed many people were fighting and I thought that was awful. I believe you are one of the most innovative scrap artists out there. Some (very few) of your techniques might be shared by others but they can't compare to your craftmanship, your high level details, your clear and balanced design- these are all unique to you. I'm glad you have kept working even though you have had to deal with health and flooding issues in your home. I am glad you aren't letting the haters keep you down- that's their goal and you win by just being yourself and doing what you do. It's a testament to your talent and abilities that you already draw so much attention- many people struggle for years before they are accepted into design teams or get more than 1 or 2 comments a posting on their blogs- your ability to be open, friendly and to make gorgeous things stood out so high above the rest you are a star of the design world- as it should be. I am so very glad you shared that. I think there is someone like that in almost all of our lives. Please continue to be yourself--you do lovely work, and who cares if one of them has done it before. Yours is better! I am sorry to say I have one in my life, too. You can see that you have TONS of support and can trust in yourself and your creative talents :) LOVE This page to pieces...the title itself is spectacular!! It's so wonderful that you are sharing this about yourself and your journey as a scrapbooker and artist :) HUGS! !